You are cordially invited to join us for a pre-awards and supporters appreciation party (artists/funders/sponsors/volunteers) and gala opening reception for 3 new shows on Friday June 14th (7-10pm). 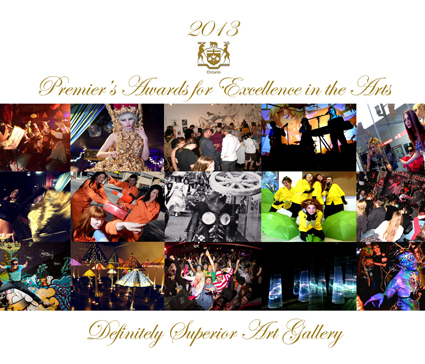 Help us celebrate the recognition of Definitely Superior Art Gallery’s 25 year history of artistic excellence in Thunder Bay & Northwestern On, respectively producing/presenting over 800 exhibitions, events, activities and supporting as many as 12,000 multi-disciplinary artists. Over 120 artists, live music from the best of Montreal-formerly of Thunder Bay-Adam Waito of Adam & The Amethysts, Super Fossil Power-Tyler Rauman & fire spinning by Dee Marie. Exquisite catered refreshments by Retro Bakery and The Sovereign Room. There will be Cake! Champagne…and oh so much more!